Commuting by bike means I bike in the dark frequently. With proper lights it isn't really that bad. In fact mountain biking at night is a lot of fun. 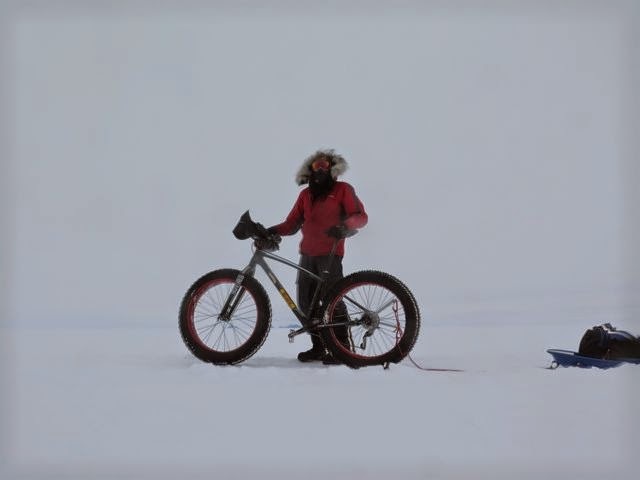 When I was in Antarctica it didn't matter what time of the day I was biking it was always light. Since then I have had a real hard time convincing myself to bike in the dark. With the days getting shorter and the nights longer I decided it was time to get over it, get my lights charged and get back to commuting by bike even if it means biking in the dark. On the way home I was thinking about some of the great things about biking in Antarctica. It is always light. True you couldn't see anything in a whiteout but it wasn't dark. The air was clean. There were no fumes from cars, and there were no diesel drivers thinking they are clever by blowing out big clouds of black smoke. It was great to breath clean air for two months. It was quiet. It was REALLY quiet. I can find routes to and from work that avoid the roads and the peace of not hearing and endless stream of cars is nice. Sometimes though it is easier to just take the short route to work and deal with the cars. It seems obvious now looking back but Antarctica was amazingly quiet. Never had to worry about getting hit by a car. There are so many distracted drivers out on the roads. I think biking to the South Pole is less dangerous than biking to work. It really was amazing to be able to ride a bike in Antarctica. I am so lucky to have had the opportunity to bike in the world's greatest wilderness.